After centuries of European imperialism in China, the tables have turned. European companies are falling like dominos into Chinese ownership. The investment is needed, but is it worth selling our security and working culture for? t the peak of Europe’s seemingly never-ending debt crisis in 2011, there was serious talk about the continent receiving financial assistance – a bailout, in essence – from China. Europe, the continent from which capitalism and modern finance emerged, was almost bust, and needed an outside power to bail it out. This had happened before, of course: the US came to the rescue during many of the continent’s wars in the 20th century. However, the possibility of a Chinese bailout in 2011 felt different; the same continent that, 100 years earlier, had been able to financially dominate China, bully it militarily, and carve up its territory as it saw fit was now in need of financial assistance from that same quarter. This was to be Europe’s Walk to Canossa, cap in hand. In the end, the Chinese bailout of Europe never came to fruition. But the mere offer, the very suggestion and consideration of the idea, signalled a clear change in the economic relationship between Europe and China. The changing fortunes of the two powers was no secret; Europe’s economic decline has been in slow progress for many years, while China’s seemingly inexorable rise has been the subject of countless studies and books. This moment, however, marked the true crossing point for the movement of power. One area in which this shift is becoming clear is in investment. Europe is fast becoming the favoured destination for Chinese investment, with Chinese state-owned and private capital snatching up assets across the continent. 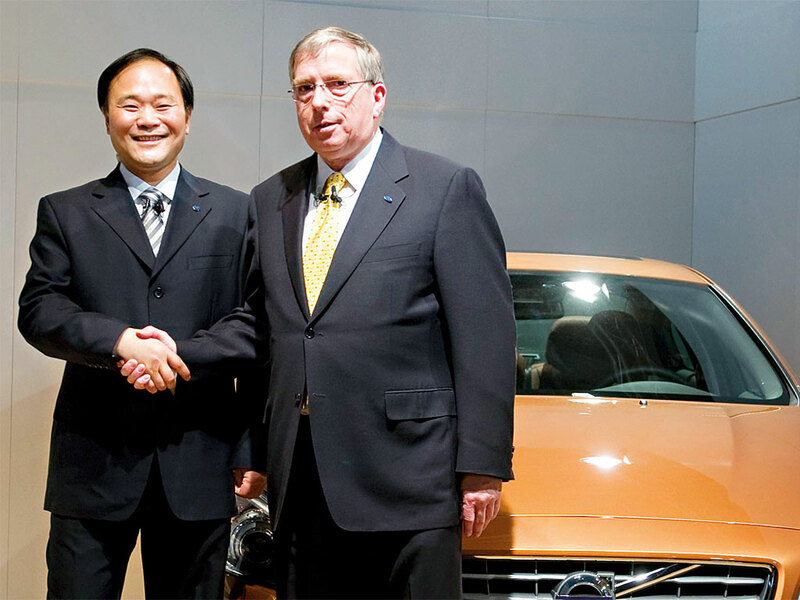 In 2010, the sale of Swedish giant Volvo to China’s Zhejiang Geely Holding Group was confirmed. In 2016, Greece agreed a €368.5m deal to sell the operator of Piraeus – the port of Athens – to the Chinese shipping group Cosco, while Peugeot Citroën in France received significant Chinese investment in 2014. The UK also benfitted, as The Telegraph noted: “The Chinese have already been snapping up plenty of British companies. Sanpower paid £480m for [retailer] House of Fraser, while Hony Capital paid £900m for [restaurant chain] Pizza Express. [Cereal manufacturer] Weetabix is owned by a Chinese company, as is upmarket tailor Gieves & Hawkes, and the MG car brand.” Though only a handful of examples, these deals confirm the wider trend. In 2014, Chinese investment in Europe totalled $55bn, according to a report published by law firm Baker & McKenzie. This figure represented a huge surge on previous years: in 2010, it was just $6bn. Of course, Chinese investment is on the up elsewhere too; as the country’s economy matures, Chinese firms are naturally going to seek greater returns from investment further from home. All the same, the figures show a clear preference for Europe among Chinese investors. According to Bruegel, a think tank based in Brussels, North America takes 13 percent of outbound foreign direct investment from China, while Europe receives 19 percent. In the early 16th century, China and European nations – including the UK, Germany, Spain and France – recorded similar per capita GDP figures. Neither particularly outstripped the other in terms of economic output or average living standards. However, as the century progressed, output per person in European countries started to rise, while the figure for China remained static. By the late 19th century, European nations were flexing their economic muscle in China. In the 1840s and 50s, the British Empire humiliated China in what became known as the Opium Wars. By the end of the century, China had ceded a lot of territory – not of its own volition – to European powers. The years between China’s Communist Revolution and the Opium Wars became known as the Century of Humiliation. China, a country that once viewed itself as having a mandate to rule the world, was forced to its knees by foreign invaders. While all foreign intervention provoked outrage in China, the Europeans – and in particular the British – left the deepest scars. China’s feeling of humiliation reached its peak when the Treaty of Versailles saw Europe fail to honour promises to return territory in exchange for China’s participation in the First World War. This prompted the May Fourth Movement, which saw the Chinese populace rise up in protest at their leadership’s weak negotiation at Versailles. Though Europe and Japan continued to carve up and occupy China after this time, the spark of discontent had been lit. Years of civil war followed, culminating in the rise of the Communist Party under Mao Zedong. Foreign businesses were gradually expelled from the mainland from the 1940s onwards: most British businesses relocated to Hong Kong. Future investment in China appeared off the cards, at least for the capitalist West. The Soviet Union and Europe’s other post-war communist nations provided some state-directed investment, largely in the form of technical assistance, until this, too, was brought to an end by the souring of relations between Mao and Soviet leader Nikita Khrushchev. From here on, China opted to go it alone. Investment was to be a matter of internal state direction. China, believing in the superiority of the planned economy, hoped to rapidly overtake European nations: during the disastrous Great Leap Forward, Mao even openly spoke of overtaking the UK in industrial production. By the 1960s, China was isolated both diplomatically and economically. Much of the world still refused to recognise it, while those that did were largely kept at arm’s length. However, in the late 1970s China once again opened up to the world, first politically and then economically. Following the reforms enacted by Mao’s de facto successor Deng Xiaoping in 1978, European firms started to seek out opportunities in China. In Philippe Le Corre and Alain Sepulchre’s China’s Offensive in Europe, the authors noted: “Groups like EDF, Framatome (which later became Areva), Alstom, Volkswagen, Philips and Danone entered into major negotiations [with China], some of which turned out successfully.” With China opening up after years of isolation, FDI from around the world flooded in, either seeing the potential for new markets or to make use of China’s vast pool of cheap labour. China saw immense economic growth for the rest of the 20th century as foreign investment poured in, particularly into the country’s Special Economic Zones. From finance and manufacturing to services, China became the most coveted destination for foreign firms looking to invest. This continued for decades, raising the country’s economic profile and wealth until the early 21st century saw another change of policy. In 2014, Chinese Premier Li Keqiang stated: “We have the ability to sell not just toys, clothing and shoes.” This signalled the next revolution in Chinese economic thought as the nation stopped just welcoming inward investment, and began to look outside its borders to become itself an investor in foreign territories. Why moving into Chinese control is seen as a sacrifice is a nuanced issue. For one thing, the level and nature of Chinese investment has caused security concerns. Huawei is China’s largest investment in Europe. The multibillion-dollar telecommunications firm has investments and partnerships across the continent. However, the firm also has clear links with China’s military, the fearsome People’s Liberation Army. The firm’s founder, Ren Zhengfei, is himself a former military engineer. In and of themselves, these links, noted Wemer, “should raise alarm bells throughout Europe”. Indeed, former CIA Director Michael Hayden has openly accused Huawei of spying. Hayden claimed he had hard evidence the firm was providing “intimate and extensive knowledge of foreign telecommunications systems” to the Chinese state, though these warnings have not led to any slowdown in Chinese investment in the West. Others see the issue in more practical terms, noting potential problems over a clash of work culture. Writing for the Brookings Institute, Le Corre noted human resources have been a major sticking point for Chinese investors: “Just like Japanese companies in the 1980s, they have found it hard to relinquish power to European managers.” Acutely aware of public perception, Chinese firms may keep on European management staff, but in many cases, according to Le Corre, “European employees have a ‘cosmetic’ role”. Furthermore, job creation is an issue, as a lack of transparency often makes it “very hard to determine how many Europeans are actually employed by Chinese companies”. The rapid growth of Chinese investment in Europe signals the great divergence is closing. In and of itself, this should be a positive development; if Chinese capital now has the might to snap up assets in Europe – along with much the rest of the world – that underlines the fact developing nations are finally catching up. The prosperity capitalism brought to Europe is no longer the preserve of those few western states. At the same time, however, there remain major concerns over long-term intentions, security and cultural harmony. China is unique and so is its rise. Its businesses often enjoy a much closer relationship with the state than do companies in other places, tying them up with politics in a way Europeans can find hard to understand. At the same time, China is not simply an economic improver looking for its place in the world market, as Japan and South Korea did before. It is a global powerhouse hoping to regain the international dominance it once enjoyed. This puts Europe, which sorely needs the investment China is offering, in a difficult position; the continent will have to balance its need for economic stimuli with its need to keep a handle on security concerns and cultural sacrifices, much as China has been forced to do for the last few centuries.